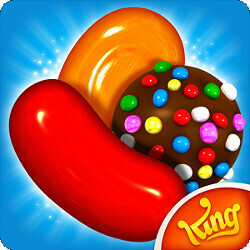 Developer King has just announced it's celebrating the release of the 2000th level for its Candy Crush Saga smash hit. The company also confirmed its game achieved an impressive milestone: one trillion gameplay sessions on all platforms. This week's update brings the 2000th Candy Crush Saga level, but players won't have to finish level 1999 in order to play the newly launched one. King confirmed that level 2000 is accessible to all players above level 10 as an in-game live event. It's also worth noting that the in-game live event will only be available on Android, iOS and Windows devices for seven days beginning September 28 during which time players will get a sneak peek into the future of the game. If you're wondering what King has prepared for you in this anniversary level, you'll be pleased to know that we've got all the information you need. In the 2000th level, players will met two Candy Crush characters going by the names of Tiffi and Yeti, as they travel to the Bubblegum Bazaar to meet … a fortune teller. Candy Crush Saga players will be challenged to collect the usual sweets and enjoy Color Bombs which spell out “2K” on the game board. Keep in mind that if you manage to complete the level you will be rewarded with two Color Bombs and one of each booster. - Each year, players swipe 41,197,500km playing Candy Crush Saga on their mobiles – that’s to the moon and back 54 times! - On average 18 billion game rounds of Candy Crush Saga are being played every month Candy Crush Saga is being played on all seven continents, even Antarctica! - Since launch, 307.1 trillion candies have been swiped and 1.4 trillion Colour Bombs have been used in Candy Crush Saga. Phones will start having diabetes soon. That is a creepy game. I never liked it. I just passed level 11 and beat 2000 in 1 try. Nice of having thr initial gold to continue play two times. Game over! I'm not a friend of the original but I do like Candy Crush Soda Saga and Jelly saga. It's a game that you can just go to if you ever have a short amount of time to waste and you don't feel like thinking. It's almost like meditation.